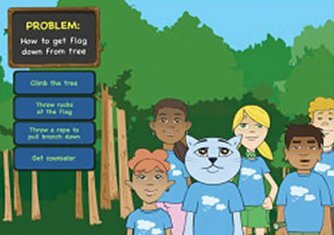 Camp Cope-A-Lot is a 12-module online program for use with children suffering from anxiety. 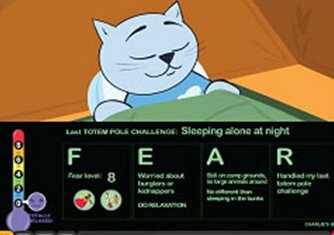 The computer program provides cognitive behavioral therapy techniques (based on the Coping Cat treatment) for 7 to 13 year old children and teens struggling with anxiety and stress. Child users advance on their own and at their own pace through the first 6 sessions, and through the last 6 sessions with coach (therapist or parent) guidance. Along with other campers at Camp Cope-A-Lot, the child goes to an amusement park, puts on a talent show, meets someone new, speaks in public, sleeps in the dark, and experiences other adventures. We hope that you find these tools to be useful in your own practice. Thank you for your dedication to helping children manage stress and anxiety! Camp Cope-A-Lot does not replace professional psychological, medical or mental health services or treatment. The Camp Cope-A-Lot program does not take the place of treatment and is not sufficient for the treatment of an anxiety disorder on its own. Camp Cope-A-Lot and CopingCatParents.com is for educational purposes. Camp Cope-A-Lot recommends that parents seek immediate psychological, medical or mental health services for their children in cases in which diagnosis of a mental health or psychiatric disorder is questioned or suspected. PLEASE NOTE: Following a security update on all Windows platforms, the original Camp Cope-A-Lot was no longer functioning on most computers and so we converted CCAL to a fully online program (no DVD required) now called Camp Cope-A-Lot Online. 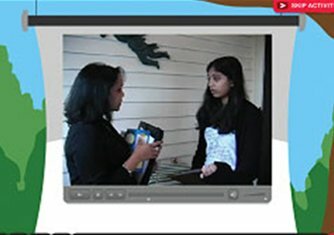 While the main CBT content is the same as in the original used in the research studies cited above, the program in its on-line form is not designed to save camper data. We recommend (as in the original version) that the campers' Go-To-Gadget be used to record their hierarchy from week-to-week and to record homework and review activities. The Go-To-Gadget can be downloaded and printed from within the program online.